Canadian teenager Bianca Andreescu will soon be ready for a break after her breakout start to the season. Andreescu, who has surged to No. 24 after starting the year at No. 152 in the world rankings, said Tuesday that she plans to take some time to recharge after the Miami Open. "I really do think I need a good two or three weeks off to get out of my tournament mode and focus on my body, my training and my mind," Andreescu said on a conference call. This is uncharted territory for the 18-year-old from Mississauga, Ont., who looked exhausted at times last week at Indian Wells. Andreescu fought through aches and pains, cramping and fatigue en route to her first Premier Mandatory singles title. She beat Angelique Kerber of Germany in a gruelling final that lasted two hours 18 minutes. "I've never been in a situation like that before," Andreescu said. "I've never been in a final of a Premier event playing a very high-level opponent. I think all of the emotions and all of the tension that was going through my body, that caused me to get even more tired than (usual). "But I'm definitely seeking help for that. Tennis Canada has a great group of doctors and I've been running some tests with them to see what the problem is." Another Premier Mandatory stop is on tap at Hard Rock Stadium, with Andreescu scheduled to play her first-round match Wednesday night against Romania's Irina-Camelia Begu on the showcase court. The ATP Tour event runs concurrently at the same venue through March 31. Felix Auger-Aliassime of Montreal will meet Italy's Paolo Lorenzi in a final qualifying match Wednesday morning. Milos Raonic of Thornhill, Ont., and Denis Shapovalov of Richmond Hill, Ont., have first-round byes. The upcoming WTA Tour calendar includes stops in Monterrey, Charleston, S.C., Bogota and Lugano, Switzerland through mid-April. Andreescu plans to meet with coach Sylvain Bruneau and her team to discuss plans for the rest of the season and re-assess her goals. "We'll need to be very, very smart with the way we adapt to everything," Bruneau said. "We're (playing) Miami and then we're going to sit down and re-evaluate everything." Andreescu has criss-crossed the globe over the last three months. She needed to win three qualifying matches to get into the ASB Classic main draw last January in Auckland. She dispatched former world No. 1s Caroline Wozniacki and Venus Williams en route to the final. Three more qualifying matches followed after she arrived in Melbourne for the Australian Open. Andreescu fell in the second round at the season's first Grand Slam. She returned to North America and won the lower-level WTA 125K Series event in Newport Beach, Calif. Andreescu then anchored Canada to a Fed Cup win over the Netherlands before making the semifinals at Acapulco. Her seven-match run at the BNP Paribas Open included wins over top-20 players Qiang Wang, Garbine Muguruza, Elina Svitolina and finally Kerber, a three-time Grand Slam singles champion. "My game really throws other people off," Andreescu said. "So if I keep improving my game, a lot of good things can happen." It's possible that Andreescu could sit out until Fed Cup play resumes April 20-21 in the Czech Republic. Her workload, travel and opponent quality are much different from previous seasons when she primarily played junior or lower-level ITF tournaments. "I'm feeling totally fine ... I proved to myself that even if I'm really tired, my mind just took over," she said. "I think I proved that on Sunday." Andreescu pocketed over US$1.35 million for the title and moved into fifth place in the Race to Shenzhen standings for the eight-player WTA Finals. Her 36-spot jump in the rankings will help with future draws. Andreescu won't have to go through qualifying rounds and will start getting some first-round byes. "This young lady has such phenomenal potential and it is all about peaking for the Slams," said Tennis Canada president and CEO Michael Downey. Andreescu didn't have time for a big celebration after her win on Sunday. 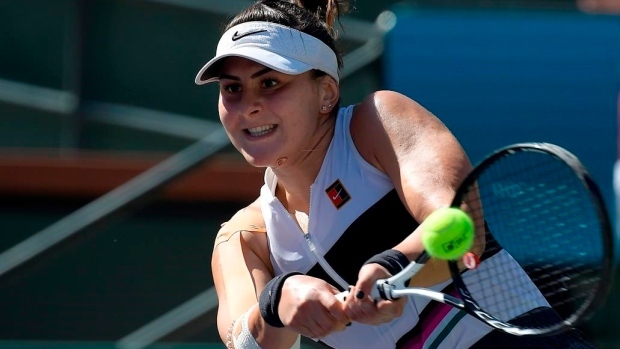 Bruneau joined her for a three-hour drive to Irvine, Calif., — stopping for a bite at an In-N-Out Burger joint along the way — before Andreescu squeezed in a late-night physiotherapy session. A day of cross-country travel followed Monday. "I didn't really have time to process it," Andreescu said of her victory. "It's pretty overwhelming but I can definitely get used to this feeling."